I am in delhi now. Exactly from Punjab. Kindly help me. I sold my house in Delhi and am living with my daughter.How do I change my address in my voter ID. Dear sir, How to change in my birth date in voters id.. I was live in Faridabad, haryana. But now I’m living in Patiyala, Punjab. Change of voter ID Address in the same state. On my voter ID card fathers name gender printed is wrong. I want to change address in voter id card. both old and new address are in same city (Ahmedabad). I guess i need to fee Form 8A. I am leaving in rented place. i don’t have rent agreement and i have only Bank statement (HDFC and ICICI) as address proof for new address. Is it valid address proof? I need to change my voter id address . For the old address proof , i have passport and SBI bank passbook . For the new address , i have aadhar card. Please let me know if these documents are valid to change the address. My old address in mehsana, gujarat, but now new address in Ghatalodiya, ahmedabad. What is the online process of that? Is required to submit Form-7 first? Aje pehla j divse form number 6 available nthi. Is there an option to change the address of voter id through online? I have shifted from kolkata to bangalore after marriage . I dont have any address proof of my new house . I only have marriage certificate and sale deed of my huaband’s name . Can i submit both of these as address proof . Hi, I already have election voter ID card of Delhi as that’s my permanent address, however currently I’m living in gurgaon hence need to change the address to my present address. Please suggest fastest and easiest way to get a new election ID card on present address of gurgaon. Is the case of moving one district to another district, after the marriage I want to change the address in voter ID. In this case the ration card is enough for the address proof. Because in this case I wont be able to get any address proof in my name like electric bill, Telephone bill. sir ,if ,I will apply online for completely change of my address ,as i have moved to completely different or next state , in how many days , i can get my voter id card & whether they will send me by post or i have to collect it from office ? I need to change my mother’s address on her voters I D. She us currently residing in R S Pallya, Bangalore and her old address was in KGF. How do I do this? Also the spelling of her name needs to be corrected. I want to get my address changed in my voter id card as I have moved to a different location in the same city, but few days ago I lost my voter id card. What is the procedure now, What can be done? Can I still do something to get both the issues resolved? How to Check My Voter ID Status Through Online. & How Far I get a Voter ID. Here is the full process to fill the form 8A: https://voteridcard.org.in/166/voter-id-address-change-online? Is it possible to change address now on line my voter id and my family members from from SALEM to CHENNAI now as assembly election is round the corner? Yes, it is possible to change Voter card Address online. Find here the process: https://voteridcard.org.in/166/voter-id-address-change-online? Sir/Mam, I would like to change my address in EPIC card, but do not have any address proof of my current address as we live on rent and often change our house. Every proof is on my father’s name and BLO are asking for my personal address proof and are not accepting my fathers. If you could give any solution it will be very helpful. Show Ration card along with your Address proof. Follow the above given link process to change online. Sir my address is incorrect in my voter id card. Please suggest me the steps to get it corrected online. Follow the below link process to change it online. The online form does not allow uploading of documents. It persistently gives an error dialogue saying that the file one is uploading is corrupt. I have tried with multiple files (jpg, png, pdf) but does not work. That was frustrating and now I will have to physically go to the election office to give documents. Who has the time to do all that? Wish someone would check whether these online forms work! 1. Save the file again as .jpeg. In fact, you can use tools like http://compressjpeg.com/ to download the smaller version of the file. 3. There is no complusion to upload all the documents online, you can handover it when BLO officer visit your place. Sir, I want to change my voters id card to a different state so is form 8 enough for the whole process…also i wanted to know how long will the process take to complete. My mom-in-law would like to change her address in voter ID Card. Last year she shifted to a permanent residence. However, there is no proof of the new address like electricity or telephone bill etc . What can be done? 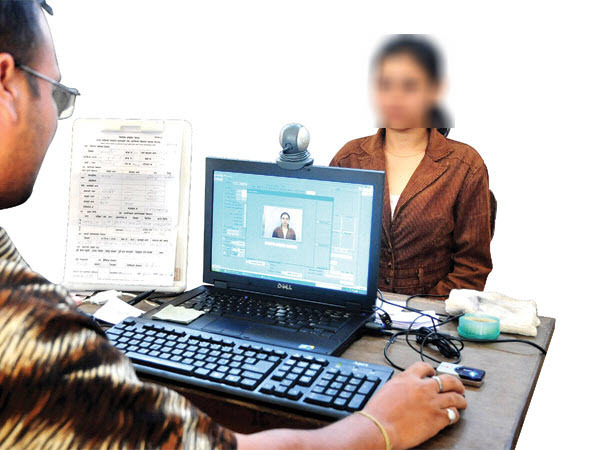 Now, she must have documents, you can change it online here: https://voteridcard.org.in/166/voter-id-address-change-online? I have shifted my house from Jalahalli Cross to HAL 3rd Stage Indiranagar. For change of address while filling Form 8A, it asks for the Part Number to which the entry has to be transposed. How do I get to know the part number of my new locality ?? Part Number can be found from any local electoral office or booth level office of your new area. please give advice how can correct of my father name in voter ID card. You need to fill Form 8 found here – Form 8 Online and submit the scanned documents for ID and Address with Photograph of your Father. I get married recently. I want to change my address in my voter id. I need it urgently. If I fill form 8A where i have to submit? I dont have any id proof in this address so can you please guide me how to do? I have filled Form 8A. I need to upload the documents for address proof and the voters id. Can i submit Form 8A only with electricity bill for address proof? Is that the pdf i need to attach for address change or do i get a separate voters id slip online? I couldn’t find it on the link u previously sent. You will get a voter slip. Please find how to do so over here. i want to change my address on voter id as i moved to new address but this house is rented n i don’t have any address identity . how can i change my address on voter id please assist for the same . You can you use the rent registration document that shows you are currently a residence of this area. This should help in changing address of your Voter ID Card. how can i change my address, pls…………tell me. You can change your address in Voter Id card online by following the steps given in this post above. It is has every step to help to change address in voter id card. Sir, we have recently(6 months ago) moved to a new address in the same city and due to some reasons i have not received the original aadhar card, but i do have a copy of e-aadhar, which is sometimes not treated as the address proof. So, sir can I use my bank account passbook as the address proof? Please help me out. Moreover sir, the electricity bill(which is a accepted address proof) and all other bills of our new residence are in the name of my father. So, are these bills acceptable as my address proof? Your bank passbook can be treated as a valid address proof. Part Number and Serial Number of the voter list where you are already registered. You need to submit the form along with proof of address, such as a rent bill, electric bill, or telephone bill of the new place and a copy of the voter ID card. You can either submit the credentials online by uploading a PDF file of the same or submit the hard copies to the Election Registration Officer (ERO). A Booth Level Officer (BLO) may visit your house to verify the form and ultimately, change the address and the polling booth (if necessary). I applied online but now it says reference no. not found. I want to konw what is the status of my address change application. SALEM – 636009. WHERE AND WHAT I SHOULD DO FOR THIS. I am Kishore residing in Bhimavaram, West Godavari District, Andhra Pradesh. I have to change the Address in the Votere Id. I understood everything in filling the application of Form 8A except the “Part number of the Electoral roll and Serial number in that part”. So please help me to fill those Credentials. I WANT TO CHANGE MY ADDRESS OF MY ELECTION ID CARD WHAT SHOULD I DO EXACTLY FOR THAT? i have changed my house from no 15 to no 16 in the same area. i want to change address to my new no i.e hno-16 . i have no address proof till now . all proof’s are of hno-15. what will be the procedure? Kindly change my Voter I.D. Address as mention. Please change my Voter id Address as mention. ADDRESS —— G – 199 NAVEEN VIHAR BEGUMPUR DELHI PIN CODE – 110086. I have recieved all 4 identity card of my family. From this 2 cards they have written wrong building name.let me know what to do? Sir plg help,I am edit my date of birth&house number in voter id card. Then in eseva give a one number for downloading the voter card. But I miss that the number. I have shifted my residence and want the address of my new residence to be put on down. Please changed my residence address on line or advise to me the procedure for this. i am married now, and my wife voter card address is old. Now am changed her address on voter card. Please tell me its procedure for change of address. sir there is mistake in my voter id they are change the address as me given to them So plz tell me how i can change? After marrige how to girl change address………..
what her change Father name ( Husband name ) or Address…??????????? This section was truly helpful. Thank you. I am Sunil Raj Dogra, want to change of address of my voter’s id and I have only a bank passbook for the proof of address only. Can I use this as a proof of address. As I am now living with my inlaws. Hi please change my address in voter id card. please do the need ful. Sir, I wish to change the residential address in my voter I-card as I`m married to Mr.Rangarajan.v, r/o. C2A/171, pocket 16, Janakpuri,New Delhi.I have received 8a form from the voter id office but I would wish to know what is the part number.pls tell me.thanx.and in s.no -5 of the form 8a what should be written? pls email the reply as soon as possible today. how to change my address as iam located in same constituency but the door num is changed. hi Sir please change my address in voter id card. how to check my voter id details in online with the help of Epic no. Sir i want to change my name and address online. How can i change? I downloaded form no.8A bt i m confused about on which website it going to submit. Plss help me and ans me on which website it going to submit. Sir i want to change my address online. How can i change? I downloaded form no.8A bt i m confused about on which website it going to submit. Plss help me and ans me on which website it going to submit. CAN I CHANGE MY ADDRESS IN VOTER ID CARD IN SAME CONSTITUENCY ONLINE. How to check my voter id details in online with the help….. I want to correct my name spelling on my voter id. I want to correct my name on voter id as per my educational document. Hello sir, I applied for voter id card in online but they didnt contact me!! !what i must do???? Mallasandra,Off Kanakpura Road ,BBMP Ward No.198, Needs to change of Address & New EPIC . Pls advice. Pls help & advice: Change of AC & lost the EPIC ? We have shifted from Bangalore AC-172. to a new address may be AC different(BBMP Ward No.198) . And lost all the EPICs of my entire family members . How to change the enrolment & get new EPIC . we were living in ASHOK VIHAR, DELHI-110052 AND POSSES VOTER I CARD FOR THE SAME. NOW WE HAVE SHIFTED TO DWARKA SECTOR-5. As we have changed our residence now& there is spelling mistake too in our name. I WANT TO CHANGE MY VOTER ID ADDRESS CAN YOU PLEASE GIVE ME INFORMATION SRI…………..
i want to change my address……..so what should i do….. plzzz tellll???? how can i change my address and correction of father’s name? i have downloaded the form8A to change my address in my ID card. Can i submit that form through online? if so, in which site shall i do? I WANT TO CHANGE MY ADDRESS OF MY ELECTION ID CARD WHAT SHOULD I DO EXACTLY FOR THAT. I want to change old address and add new address in my voter ID card. my DOB have some changes ,when i changes to apply will the voter card number changes? my voter id -Address door no (Old) is 10/11. But my new number 57. How to change my door number 57 instead of 10/11. I specified my new address door no as 8/464[New No] but it not accepting…. how can i change the address on my voter card as my voter card is issued from amritsar (PB) and i have shifted down in Panchkula (Haryana) 2 years back. waiting for your earliest response. I want to add my surname in my voter ID card. Kindly advise which form i have to fill. I would like to obtain the Part No/Serial No of my Voter I.D. Card, hw do i get this could u pls help me as to where i could get this. Our family has shifted address from one assembly seat to another , please assist with steps to be taken for renewing our voter id cards. my son is married recently. after marriage, my daughter-in-law’s surname and address are to be changed in her existing Voter Card.. She is having her Voter Idendity Card and enrolled in the same city. I would like to know which form she has to fill up and whether address proof of my son can be used as the address proof for my daughter -in -law? Sir can you help out bcoz in my voter id there is lots of spelling mistake they have done so how to change it give me a way. VOTER I CARD ADDRESS CHANGING PROCESS DONE BUT TILL NOW MY ADDRESS IS NO CHANGE IN VOTER LIST. How to change my address in voter id card of same Assembly Constituency.Please suggest me sir…..
my name in ID card is wrong. my card number-WNC0309724 /name mistek; v.prima /correct name; v.prema /please change my name . I have not collected my Id Card which was applied in December 2012 for change of address. But till date except harassment 3 times I could not get it. It is not mine case it is with most of citizens who went there for election/voter Id card. More over I have been threaten there. please help me i need change my fathers name in voter id card..is it possible how can i change/ what is the procedure??? i am really struggling to get my details changed on my voter card even though i have submitted all the relevant forms and the relevant documents. no one replies to ur queries. i am a voter card holder and just want to change my details still that will take 2 months. amazing. that’s y we are far behind western countries. if someone really cares kindly improve the process. people dont feel like working in their voter card offices. Even ur toll free number displayed on the website is not working. kindly do the needful. if someone is listening !!!! Pl help how do i chnge address of my electrol ID card? I have submitted the form8 through online and did not have print of it. How can I get it and do I need to submit the electricity bill? where do i need to submit if so..
can you help me that how and where to submit the credentials pdf online ?? it would be really hlpful if you could help m with some website link. How to check my voter id details in online with the help of Epic no. & I want to Change my address. which form i have to download for changing address in my voter id and how cam i download it means from which website and how ? i want to change my adress in voter id bt i dnt have adress proof to submit.so cn i submit any anthr document??? how to get the part number and serial number of the voters list? sir, i have applied for a new voters id card. because i changed my residence .whether my old id card should be returned to blo at verification.now i have not included in voters electoral list with old id card number. Please give me a reply. Sir we have changed the address in the form . we would like to know in which web site we have to check the changed address in voter id. You can check the details as to the updated address or any other information related to you Voter ID card, by simply entering the EPIC/Voter ID Card number in the Search by EPIC No option over here in this link – Click Here. If the records are updated the new changed information will be displayed. there is a mistake in the date of birth in my voter card,how can i change it sir???? sir mara voter card gum ho gaya hai muje dusra voter id card chahiy. ID card banwana hai iske liye main kya karoon. how to day can change my voter id card add…. Dear Sir/Madam my election card no is SGH1593508 earlier i have applied for election in which address was wrongly wriitten and again i have filled the form requesting to change the address and to make necessary correction in the election card but still i have not recd the election card plz check and makenecessary correction in your card and address also. i have seen online but still address is not changed neither and correction being made plzz send me election card as soon as possible . How to change my voter id details in online with the help of Epic no. I have shifted my residence and want the address of my new residence to be put on my Voters ID. Please advise to me the proceedure for this. i want my address to be changed from parrys, chennai-600001 to nungambakkam chennai- 600034 in my voter id..
Voter card ki correction process yaha se jainye: https://voteridcard.org.in/4504/voter-card-correction-made-easy? to use ab kaise thik karvau…..
Here’s how you can change your Voter card Address online: https://voteridcard.org.in/166/voter-id-address-change-online? You can change your Voter card Address here: https://voteridcard.org.in/166/voter-id-address-change-online? Please follow the process given in the post above for Address change.